Yesterday I decided to venture out of my comfort zone and participated in the Midwest Cream Cheese Competition. I’ve heard about this competition over the past few years and have always been intrigued since cheesecakes are one of my favorite things to make. Last year was our first year back in Wisconsin so I could have easily taken part in it, but I had a new baby and didn’t really feel up to the challenge. But this year I was ready! The choice of recipe was fairly easy since my family members always request this one for get togethers. 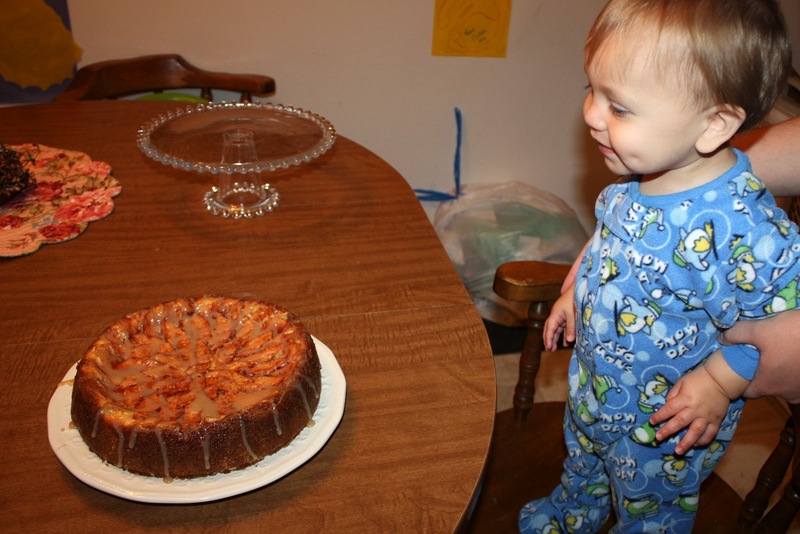 I’ve probably made this cheesecake recipe more than any other dessert. It’s pretty tasty. I thought to make this recipe a little better than usual I’d kick it up a notch with a homemade caramel sauce. Which is the story behind all my recent caramel posts. I decided to go with the Salted Vanilla Bean Caramel Sauce which I made ahead of time of Thursday night. 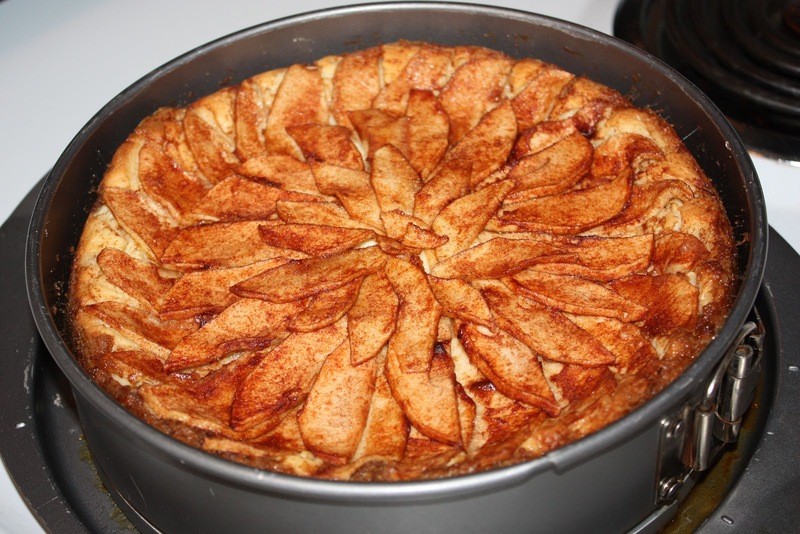 I love the crust in this recipe. Most of the other cheesecakes I make are chocolate based with oreo crusts, so it always surprises me how good this graham cracker one is. 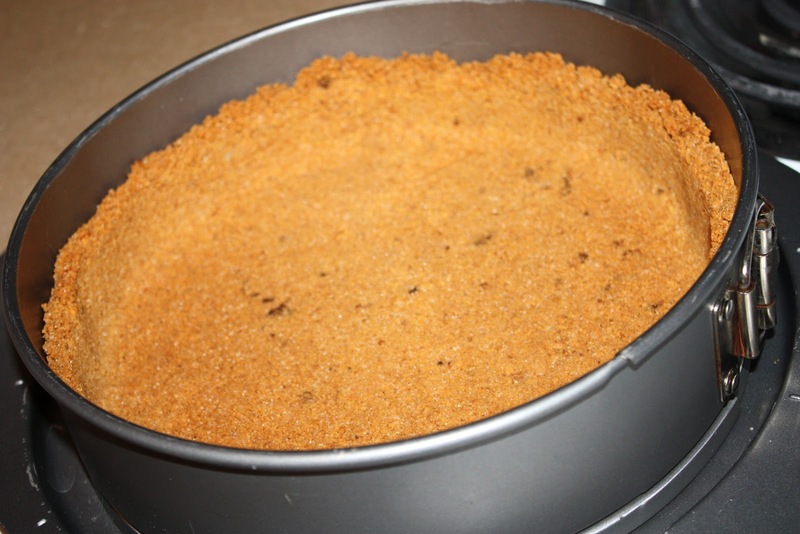 You just mix 1 1/2 cups graham cracker crumbs, 3 tablespoons of sugar, 1/2 teaspoon of cinnamon, and 1/4 cup of melted butter. Mix until all crumbs are moist from the butter. Then press into a 9 inch springform pan. I used a glass to make the bottom and sides of the crust flat and even. I really wanted high sides on this cheesecake so the glass trick worked out perfectly. When the crust is ready, bake it in a 350 degree oven for ten minutes. Next you mix three packages of cream cheese (at room temperature!) with 3/4 cup of sugar. When it looks nice and creamy add 3 eggs (also at room temperature), one at a time, beating after each egg. Then mix in 1/2 teaspoon of vanilla. The filling should be smooth and fluffy. This next part isn’t very exact. 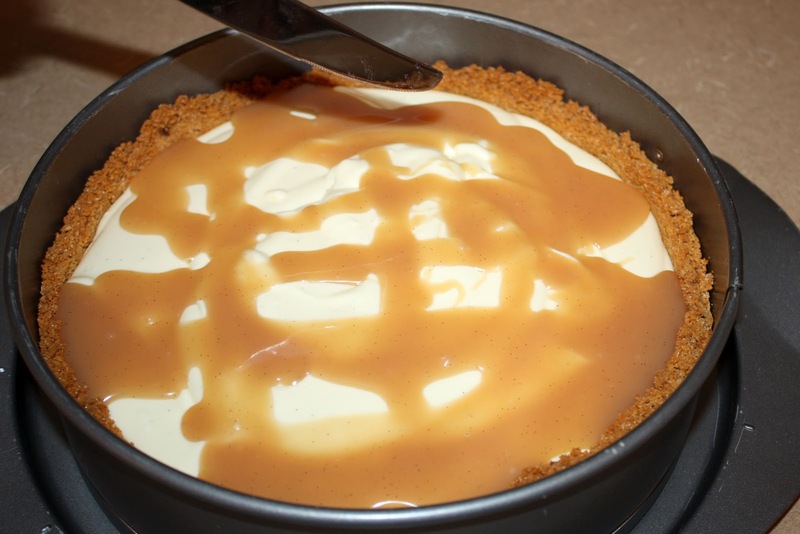 I poured about half of my caramel sauce over the cheesecake and then used a knife to gently swirl it into the filling. This is a lot more caramel than I usually use because I was hoping to really infuse the cheesecake base with a caramel flavor. I don’t think I was very successful, though. Next time I might just mix caramel into the filling completely to get a fuller flavor. The design turned out so pretty I didn’t want to cover it up! This part isn’t very exact either. 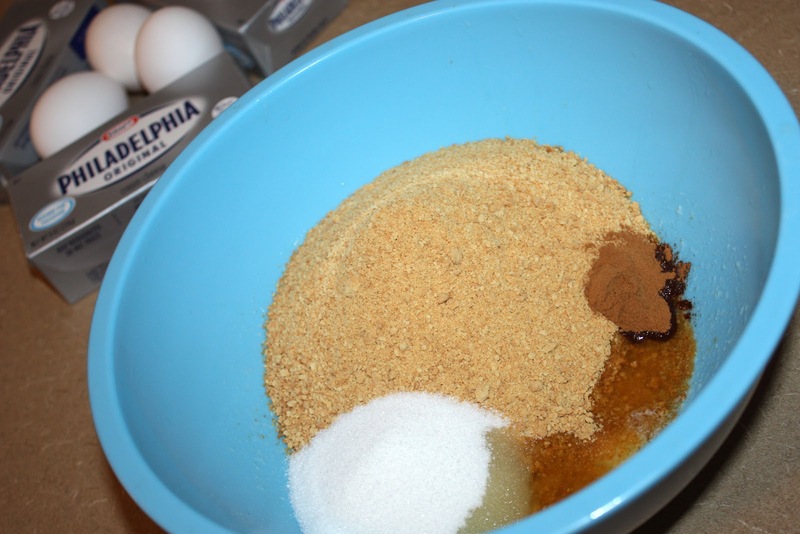 First you mix about 1/2 cup of sugar with 1/2 teaspoon of cinnamon. Then core, peel, and slice between 2 and 4 apples. It’s really up to you how many apples you want. If you’re making a special design you’ll only need a certain amount. 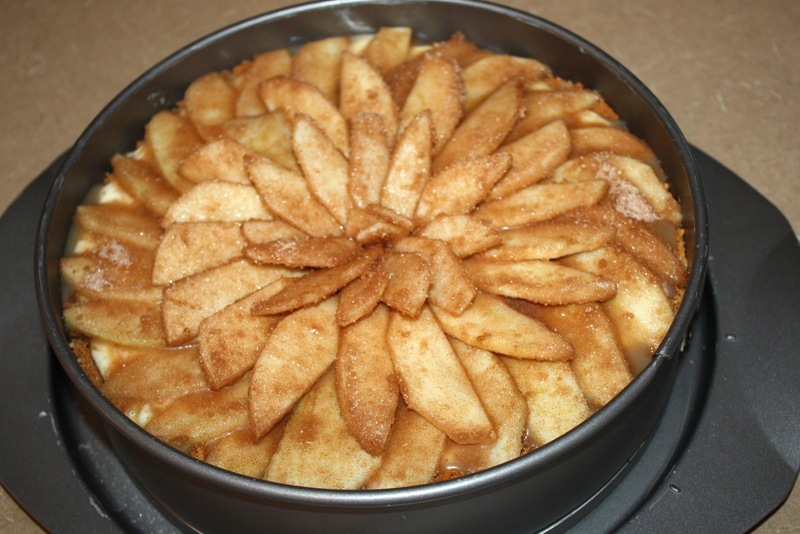 But if you want more apple flavor you can push chunks into the cheesecake as well as layering on top. 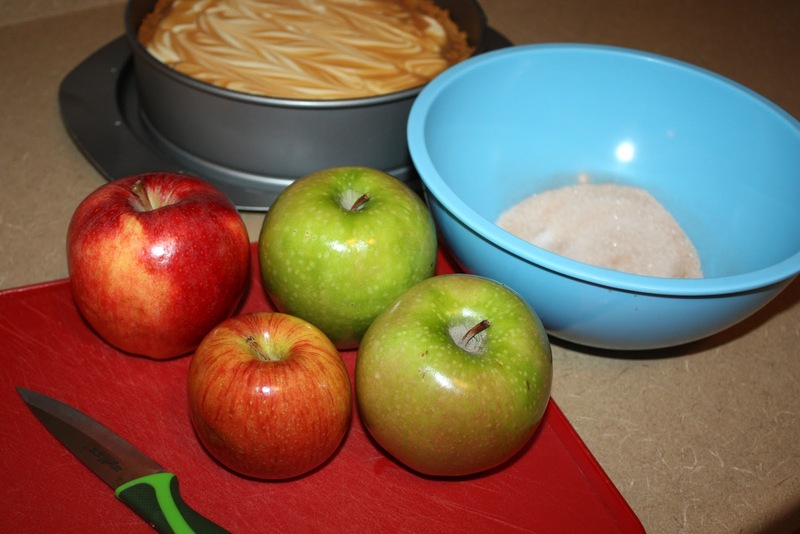 I ended up using about one and a half of the larger apples and half of the smaller apple. This is one apple’s worth. 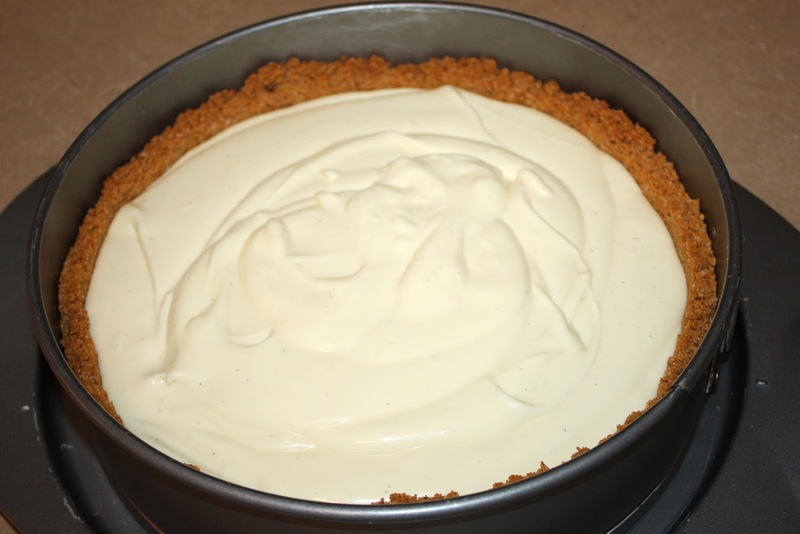 Next, bake your cheesecake at 350 degrees for 60-70 minutes until the middle is no longer jiggly. Then turn the oven off, open the door, and let the cheesecake rest in the warm oven for an additional hour. 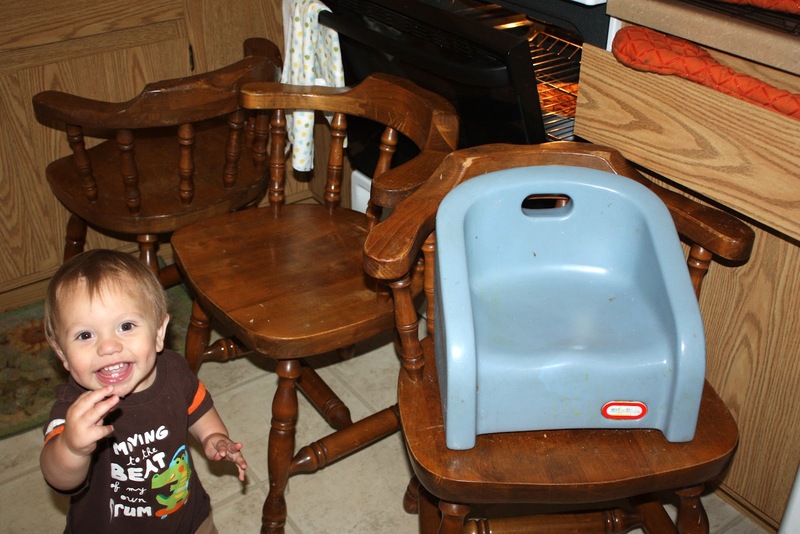 Since Shepard was running around and I didn’t want him touching a burning oven I had to barricade him from it. Which if course made it an even bigger attraction. This is what it looked like straight out of the oven. I think I liked the design a lot better before it was baked! I was unsure about when to pour the caramel on top, so I waited until Saturday morning just before we left for the competition. I was kind of disappointed in how the final product turned out in appearance. 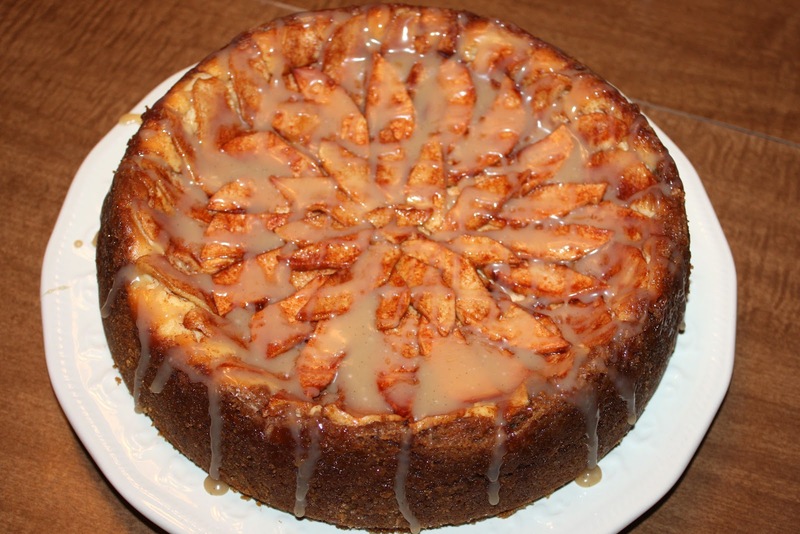 The caramel looked more like a powdered sugar glaze on top of the darker cheesecake. 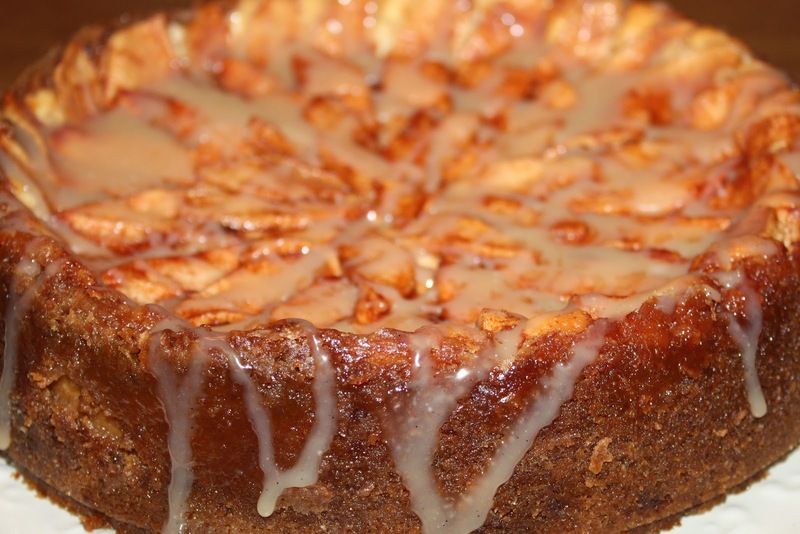 Maybe it would have been better to just use a rich store bought caramel after all. So here’s the cheesecake! I was impressed with my efforts, but I didn’t win. 🙁 I wish I could have gotten some pictures of my competition. There were only 24 cheesecakes entered, but some of them looked absolutely amazing. I didn’t know what to expect this year, but I’ll be a lot more prepared next year. I already have a list of ideas going! At least my family will always love this recipe! Begin by making caramel sauce. Heat sugar and water in a saucepan over low heat until sugar is completely dissolved, stirring gently. When the sugar is dissolved, bring the heat to medium. Do not stir after this point! Let sugar mixture boil until a dark amber in color, gently shaking the pan every few minutes. Take off heat and add heavy cream and butter. If caramel solidifies put it back over low heat and stir until creamy. Add vanilla and sea salt. Preheat oven to 350 degrees. 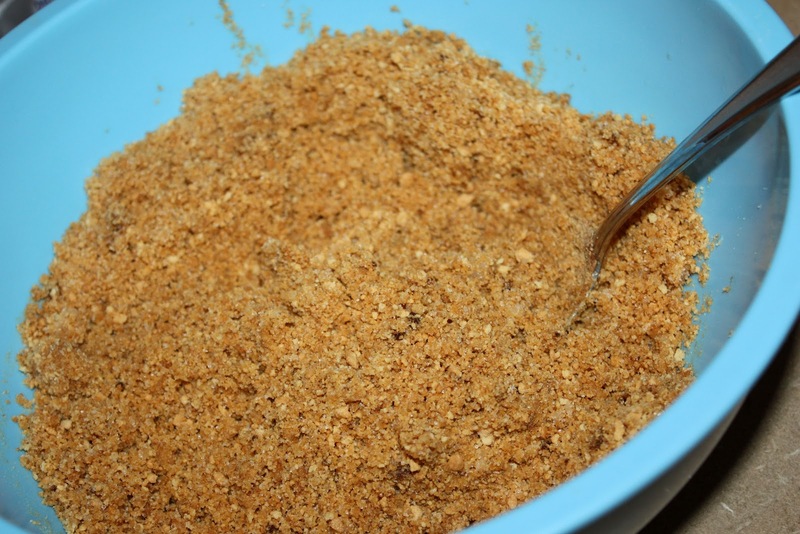 In a large bowl mix graham cracker crumbs, sugar, cinnamon, and melted butter. Press into a springform pan. Bake for 10 minutes. 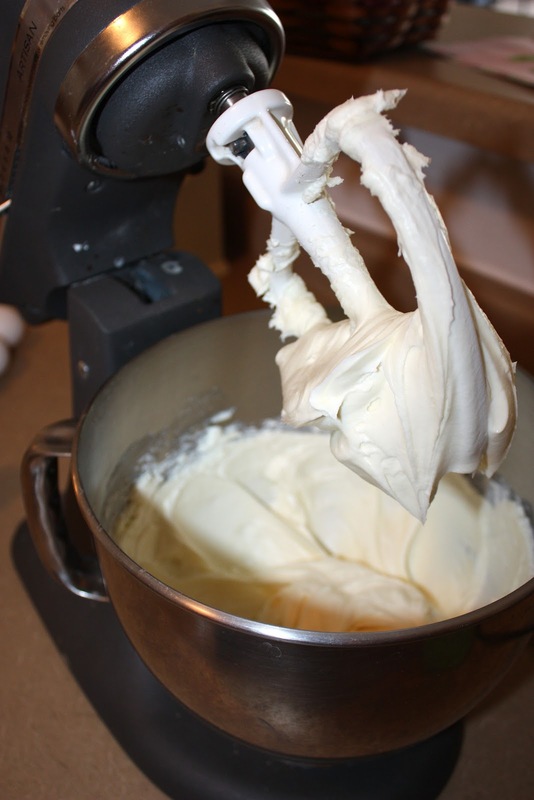 In a mixing bowl combine cream cheese and sugar. Beat until well blended. Add eggs, beating after each one. Add vanilla. Pour filling into crust. 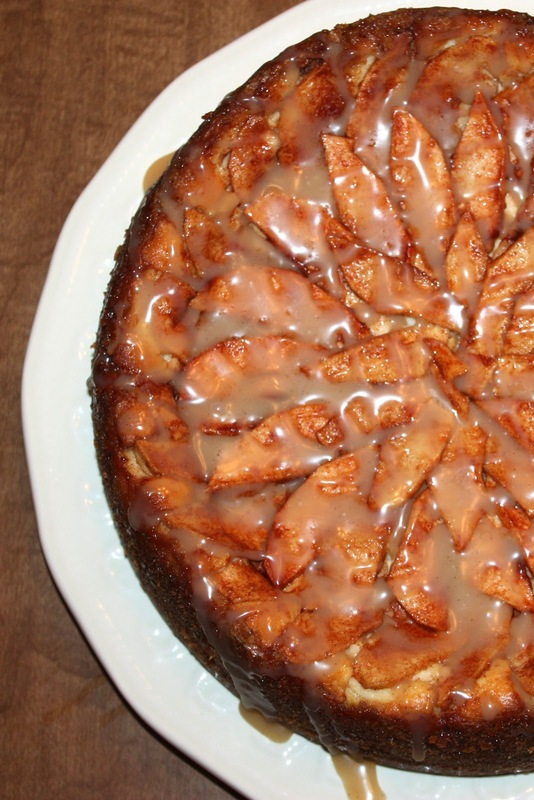 Pour about half of the caramel over the filling and use a knife to gently swirl it into the batter. Mix cinnamon and sugar. 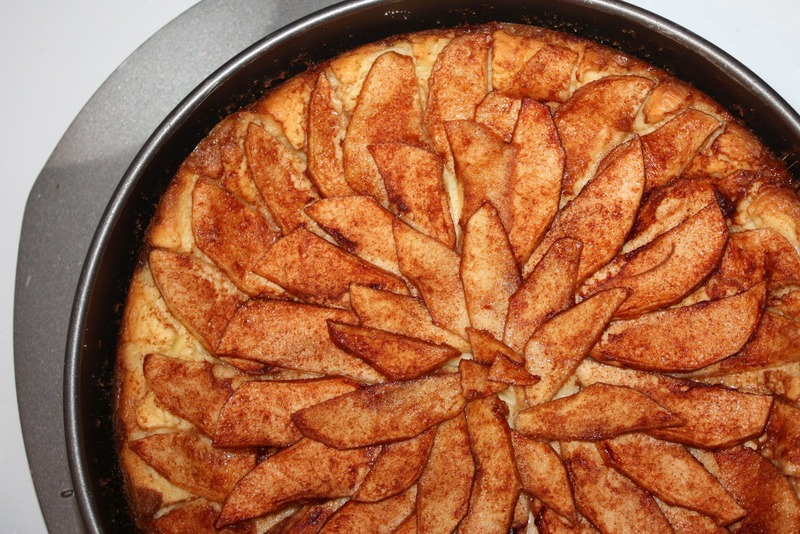 Slice apples and coat in cinnamon sugar mixture. 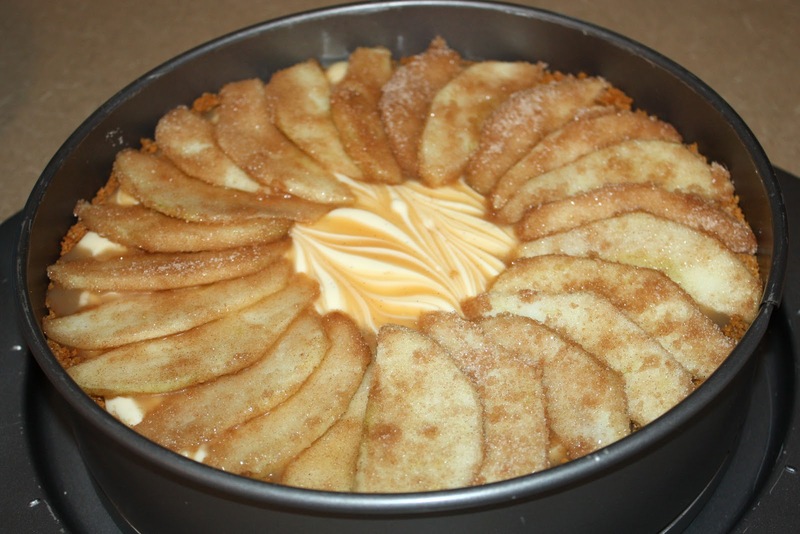 Cover cheesecake with apple slices. Sprinkle on any remaining cinnamon sugar. Bake in preheated oven for 60 minutes. Turn oven off, open the door, and let cheesecake stay in the oven for one additional hour. 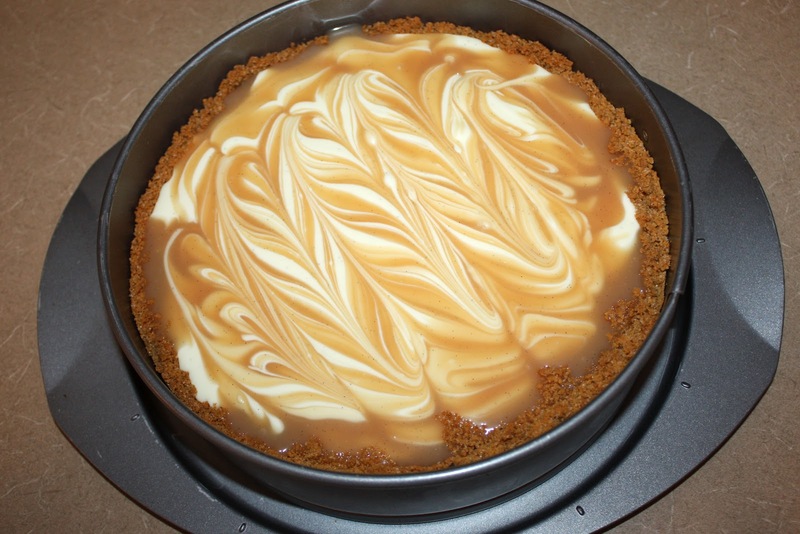 Pour remaining caramel over cheesecake and refrigerate.